The development, nine months in the making, came the same week as The Guardian published a video that appears to show a Portland police officer declining to arrest the two suspects, despite having reason to. 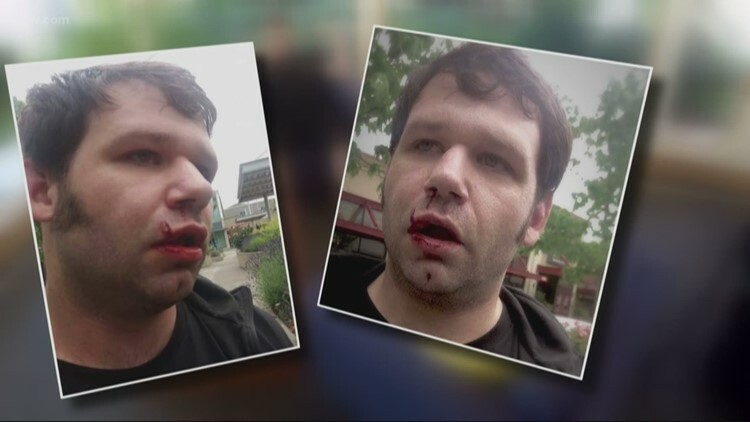 PORTLAND, Ore. — A Portland man who reported last summer that two members of local far-right groups had attacked him on a busy street in broad daylight told KGW a grand jury has indicted the pair on assault charges. On Tuesday, the Multnomah County District Attorney’s office released a statement confirming the indictments against Tusitala “Tiny” Toese and Donovon Flippo, first reported by Willamette Week. The three-count indictment was filed on Feb. 28 and was made public Tuesday after Flippo was booked into the Multnomah County Detention Center. Toese and Flippo, who identify on social media as members of The Proud Boys and Patriot Prayer, are both charged with assault in the third degree and assault in the fourth degree. Ledwith said he physically waved them off, and they zeroed in on him, yelling homophobic slurs. He said he yelled back, calling Toese “Tiny”. That’s when Ledwith said the two men jumped out of the truck, ran over to him and punched him multiple times. Ledwith said, as far as he could tell, the case stalled for several months. Willamette Week reported prosecutors had asked police for more evidence, to no avail. Prior to Tuesday's indictment confirmation, the DA’s spokesman told KGW the case has remained open since Ledwith’s initial report, but couldn’t comment further. Ledwith said the progress shines a needed spotlight. The development, nine months in the making, came the same week as The Guardian published a video that appears to show a Portland police officer declining to arrest Toese and another member of Patriot Prayer, despite having reason to. Lieutenant Niiya is currently the subject of an internal investigation by the Bureau for exchanging questionable text messages with Gibson. In the video, the officer tells Gibson police have already arrested counter-protesters. KGW previously reached out to Toese, Flippo and Gibson for comment. None has responded. Despite Toese being named in the indictment, he has not been arrested. Flippo is scheduled to be arraigned on Wednesday at the Multnomah County Justice Center.